The Fifth International Conference on Multimodality (5ICOM) is taking place in Sydney on 1-3 December 2010. 5ICOM is a meeting point for international scholars and practitioners from a wide range of disciplines, including communication and language studies, social semiotics, linguistics, education, (new) media studies, design, traditional and new media arts, cultural studies, sociology, history, and (computer) science. Case study presentation by Roger Mills is based on two case studies on Ethernet Orchestra networked improvisations. Abstract can be found on page 66 of the conference abstracts. Ethernet Orchestra Live @ blackhole-factory, Baraunschweig, Germany. November 16th, 2010 Comments Off on Ethernet Orchestra Live @ blackhole-factory, Baraunschweig, Germany. A great performance by the Ethernet Orchestra on Sunday, despite some technical glitches. There were some really interesting dialogical improvisatory exchanges, particularly with two rhythm players, Edward Filipp on drums in Germany and Yavuz Uydu on the Bendir in Sydney, who locked into some great rhythm beds for the rest of us us to underscore with melody and texture. See previous post for list of performers. Apologies to those trying to pick up the stream which cut out at the beginning and left a number of listeners online and our VJs without an audio stream to mix to. Discussions are currently on the possibility of re broadcasting a recording of the performance to allow the VJs to create what they had worked on producing. Listen to an edit of the improvisation. 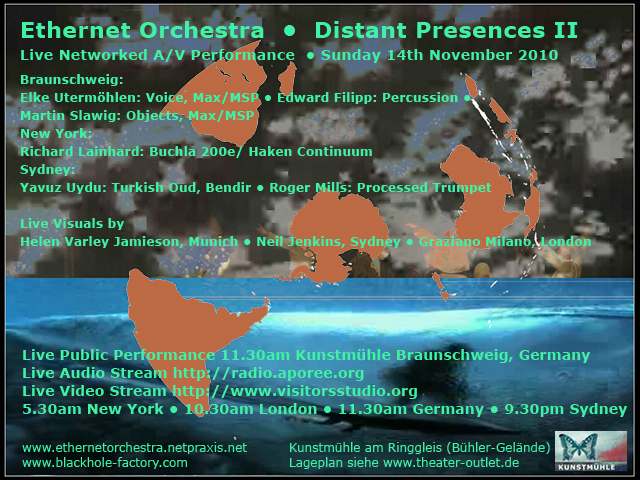 You are currently browsing the ethernet orchestra blog archives for November, 2010.